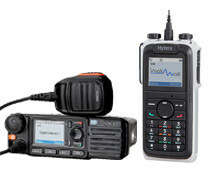 Developed for business use, Hytera DMR offer two-way radios/walkie-talkies which, put simply, transmit via a base station (possibly) through the internet and come out via another (or the same) base station somewhere else. It features selective or group calls, messages etc. for use e.g. in taxis, fire engines etc. Radio amateurs have now reconfigured the digital network to suit their own tastes and is now (at the time of publishing) a real hype! Hamshop has plenty in stock and we can even programme them for you.